A thought about this question : What is the religion of the Ducks? In the Duck universe, religion is not visible. However, we can find some clues which determinate the religion of the famous web-footed birds. Therefore, I am going to expose the different religions, beliefs and superstitions, which exist all over the Duck world. The Ducks are living in a world very similar to our, in the matter of history, geography, physics, etcetera, and also their attitudes are the same (avarice, laziness, greediness...). So it is logical that their religions are like our. Since the source material of the Duck world are mainly coming from Christian countries, either catholic (Italy, Spain and South America) or protestant (Holland and Scandinavia), Ducks could at first hand be expected to be Christian. 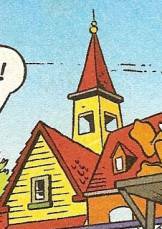 From left to right: A bell-tower of a church with a Christian cross (the Live and Time of Scrooge McDuck 1, p. 63), a church with its priest / pastor (the Live and Time of Scrooge McDuck 1, p. 53), the church of Couactown. Sometimes, even more important monuments appear, like cathedrals. 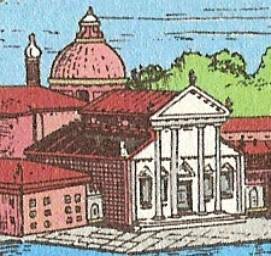 Here, a cathedral on the St George Island, near Venice, in “Adventure in Venice” (G 1699). In this story, the action takes place in Venice. The Ducks also visit many famous monuments of the Italian city (e.g. the Square of St Marc). Since Venice has so many churches and religious monuments, it is only to be expected that some of them would appear in the background. Sometimes, a religious monument is the actual scene of a story. 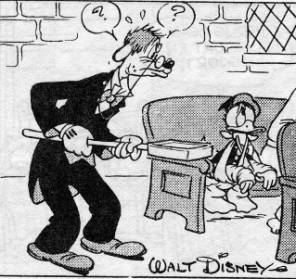 In “The phantom of Notre Duck”, Scrooge and his nephews confront a mysterious thief in the cathedral of Duckburg. On the left Notre Duck Cathedral, on the right a fountain inside it. This monument is very realistic and looks like a cathedral from Gothic time. 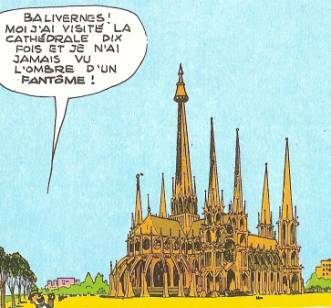 Scrooge also says that he has visited the cathedral 10 times. Why would Scrooge go to a church? To pray? 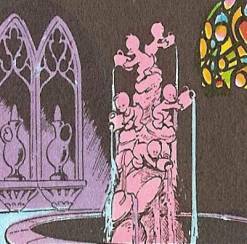 In this story, he dips his flute (which opens his strongbox) in a fountain inside of the cathedral. 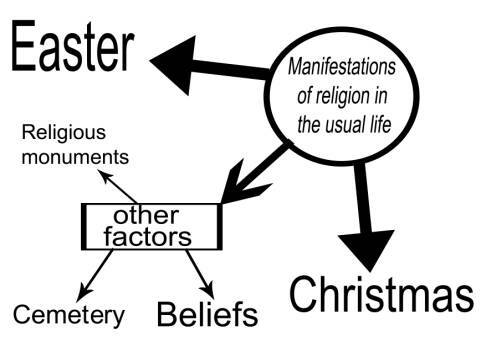 Can we deduct that perhaps Scrooge is religious? Another clue of the Ducks’ Christendom: they are buried in tombs, which look like Christian tombs. 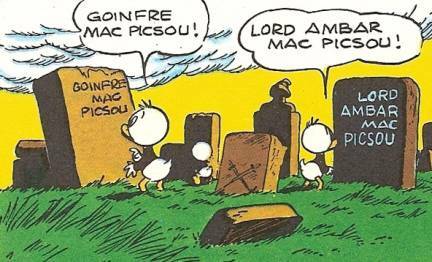 Above, Huey, Dewey and Louie are inspecting the McDuck cemetery in “The Secret of the old Castle” by Carl Barks. 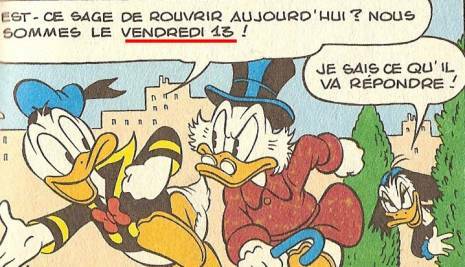 Donald tells Scrooge that it is not a good idea to open his factory on a Friday 13th (stressed in red). The Ducks think also that Friday 13th brings bad luck (see the paragraph about superstitions). This apprehension originates from religion. It was on a Friday 13th that Jesus was arrested and betrayed by Judas, the thirteenth of the disciples. So, if the Ducks like some of us think that 13 brings bad luck, it is actually a proof that they must have Christian origins - and maybe even indicate the existence of a “Duck Christ”...! 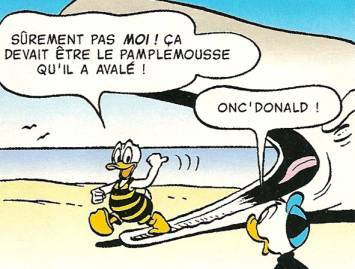 In “The Talking Dog”, Donald, who wants to be famous so he can participate on a TV-show, is swallowed by a whale. He does become famous, but the director of the channel says that the deed is nothing new: someone called Jonas did the same thing 2000 years ago. This is of course a reference to the Bible and Jonas who was indeed swallowed by a whale. When the director says it, Donald understands immediately. It means that both of them know the Bible and have maybe even read it. Finally, a last proof (but there are other): the Ducks celebrate Christmas. From origin, Christmas is a Christian feast, celebrating the birth of Jesus Christ, which proves that either the Ducks themselves - or at least their ancestors - are/were Christians. We never see actual cribs, but even this part of the feast is celebrated in many stories! Easter too is celebrated, marking - of course - the death of Jesus Christ. 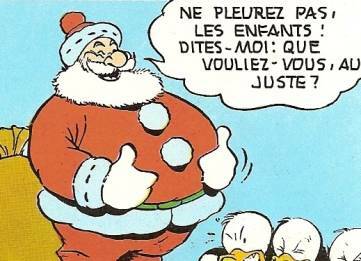 It is also funny to notice that the Ducks believe in Father Christmas! This is, however, not so strange, since he does indeed exists in their world and appears in numerous stories! Just like some humans, the Ducks are superstitious. Logical, since they are similar to us in many points. They can also have a tendency to fetishism. The best example of this is Scrooge himself. He ascribes great importance to his lucky dime and considers it a lucky charm in some stories. This coin gives him self-confidence. 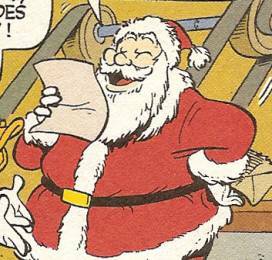 Scrooge always takes his fetish-coin with him, believing it will bring him luck. 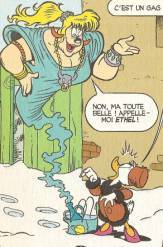 Without it, Scrooge would perhaps be nothing, as in one story by Don Rosa “The Duck Who Never Was”, where Magica de Spell steals the famous coin. 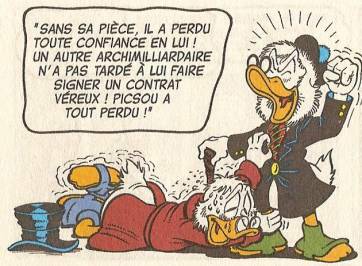 Scrooge loses all his self-confidence and signs a shady contract with Flintheart Glomgold, and he falls into poverty. When he loses the coin, his business falls down vertiginously. The Ducks also believe in common superstitions, identical to our. Here, the widespread belief that a horseshoe will bring luck. 13 and also Friday 13th bring bad luck in the Duck world (which we have already seen). 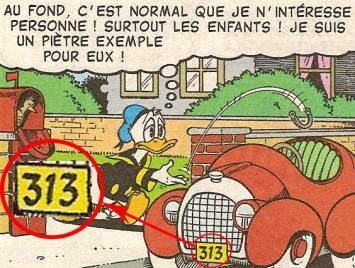 Maybe the bad luck of Donald partly has its explanation in the licence plate number of his car: 313. 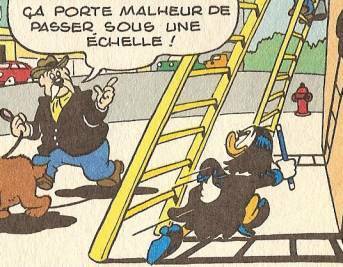 For the same reasons, walking under a ladder brings misfortune. Furthermore, some Ducks believe in paranormal phenomena. They generally believe in ghosts. 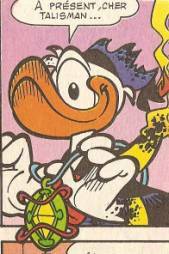 Also logical, since like Father Christmas and the Easter Bunny, ghosts actually exist in the Duck world! Just like spirits and extraterrestrials! Although afraid or surprised by the apparition of a spirit or a ghost, the Ducks usually do not faint from fear on such occasions! 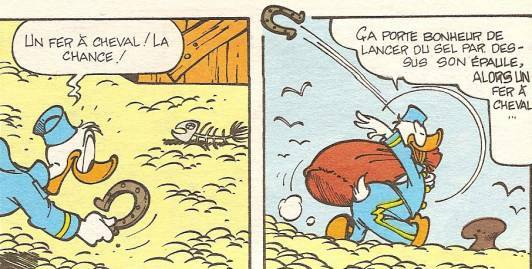 Finally, some Ducks are followers of divinations, lucky charms, grigris and talismans of all kinds. To begin this chapter, we can identify a number of religions (not beliefs or rituals) of foreign countries that appear in Duck stories. 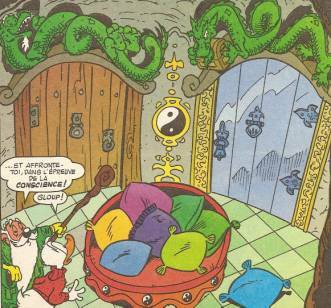 Buddhism (picture from “Kidnapping au Yubet”, which takes place in the Duck equivalence to Tibet). 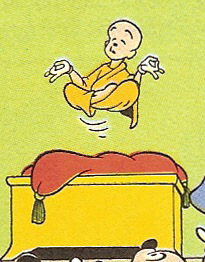 Mickey and Goofy witness the levitation of the Lamaï Lama. He does this with an extreme concentration and by separating body and spirit. Goofy also manages to levitate because his head is always empty! Hinduism. 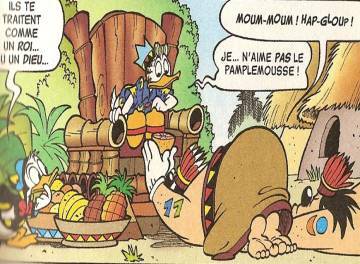 Scrooge meets the Maharajah of Passmohaloor, a country that looks like India. We see some temples and the inhabitants of this country believe in the usual Indian gods, like Shiva (picture). Confucianism. I presume that it is Confucianism, because we see in the background of the picture the Yin and Yang symbol, and also because the story takes place approximately between Mongolia and China. Since there are many Confucians in this area, I think that the hermit of the story is a Confucians. However, alternatively he could be a Taoist. Now, we are going to talk about beliefs, rather than real religions, from all over the Duck world. In many stories, we find native beliefs, which we can assimilate to animism or voodoo, some times perhaps to shamanism. We often see the natives performing ritual dances in traditional costumes, dancing around a totem or around the sorcerer (like in the left picture above). These dances are aiming to provoke rain or shine, or to worship gods and other spirits. Often, natives mistake visiting foreigners for a god or a king, either simply because of their appearance or because of a specific action performed by the foreigner in a god-like manner. He is then also venerated like a real god, until (of course) a detail or an action betrays him, after which he is pursued by the furious natives. 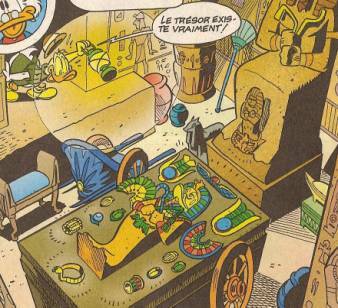 Above is shown scenes from an excellent example of voodoo, from “The Life and Times of Scrooge McDuck” by Don Rosa. 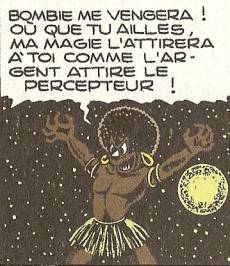 A voodoo wizard, Houla Lala (in the French version), also chief of the village, practises magic and readings of the future in bones and skulls of his ancestors. He sends a Zombie, named Bombie, against Scrooge to punish him for destroying the village. In “Land of the Totem Poles” by Carl Barks, we can distinctly see North American Indians practising shamanism. They raise totems supposed to support the sky, and use ritual potion made from drugs. They also believe in the Manitou, a supernatural power able to incarnate in creatures or objects. These different practises confirm that we are dealing with shamanism. Continuing on the subject of wizards, we find them relatively often in Duck stories taking place in distant countries. The Ducks, just like us, are rather intrigued by their strange customs and their mystic aspect, emphasising the difference to the religion of the Ducks. 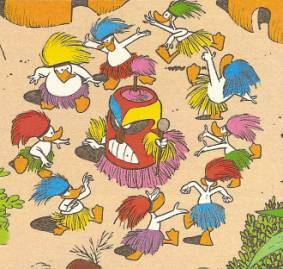 Below is shown a picture from “So Far and No Safari” by Carl Barks, where Scrooge disturbs a meeting of wizards. For this he is imprisoned. This act could reveal some degree of xenophobia among the locals, for example with the employ of the word “foreign”, clearly having a pejorative meaning. We also find even more mysterious beliefs from very distant countries, almost unknown. The Ducks seem to be both fascinated and suspicious when meeting with such customs. They are very often full of prejudice towards other people and their beliefs, finding them really ridiculous and strange. 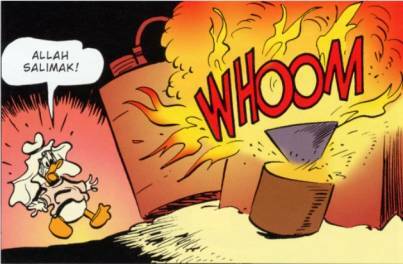 In “The Dreamtime Duck of the Never Never” by Don Rosa, Scrooge is in Australia to prospect gold. Here, he meets a rather old native Australian named Jabiru Kapirgi, who is in fact a wizard. Together they go into a cave beneath the desert hidden by the sand. On a wall is painted the Great Myth of Bindag-Bindag, which is a kind of story that can be verified always and everywhere. In this case, the Ducks have a contact with more elaborate beliefs, and above all older. It is about an initiatory ritual, an age-old, millenary tradition. A big importance is ascribed to destiny, all things that happened are already written and we cannot escape it. 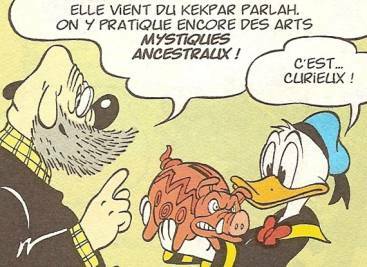 It is even verified by Scrooge himself, who according to the wizard is the great Platypus, the main character of the Great Myth. Thanks to this myth, Scrooge finds his lucky dime, which he had lost. In this chapter, I am going to talk about beliefs from the East, i.e. from Asia; not real religions but more like superstitions and sects. 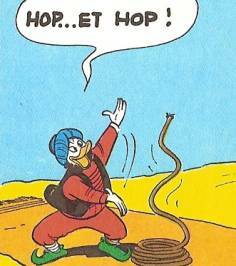 In Eastern beliefs sometimes appear the famous trick of the magic rope, performed by fakirs. Here again, “real magic” may be taking place (see also the chapter about superstitions), which makes our feathered friends both uncertain and surprised. From time to time, an Indian or oriental sage (wise man) occurs. The sage often teaches his religion or belief to the visiting Ducks (or Mouse). In the example below, a Tibetan sage teaches Donald the Tibetan Serenity, while he is in prison. With this example, we open a new religious category, the one of sects, as which this Tibetan Serenity very well could be classified. 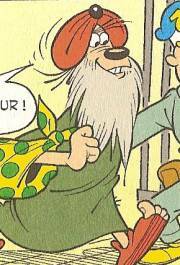 Despite of quite rare appearances in the source material, we do find some sects in Duck stories: for instance the “Rali” Sect, whose members are the Thugspetou (in the French version), oriental Beagle Boys. Their “divinity” named Rali is a kind of statue / giant. The followers of the sect commit all of their crime in honour of their divinity or even on request from her. So, the Ducks know about the existence of sects, even if it seems that they are not present in Duckburg. Some are even afraid of them, because (it is believed that) they practise sacrifices and mystic actions. In ancient Anatide Egypt, where religion is, or rather used to be the same as in our world: polytheistic and with the use of mummification. Very often, when Ducks (or Mice) make excavations of a pyramid, a mysterious malediction intervenes, all though usually false and fabricated by the Ducks’ opponents. Ancient Anatide Greece with its polytheism is also very close to our antic Greece. 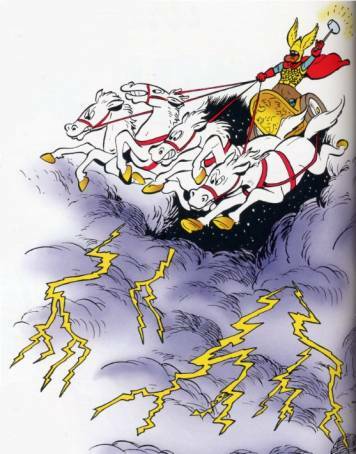 It is funny to notice that for instance in the example shown above, Mickey meets Greek gods, even if he is supposed to be Christian, and so a monotheist! This does indeed create a paradox: Greek and Latin religions seem to exist alongside Christianity, and consequently Greeks gods could mix with the Christian God?!? To follow up on this thought, all the creatures populating the island Mythologia come from the Greek-Latin mythology. 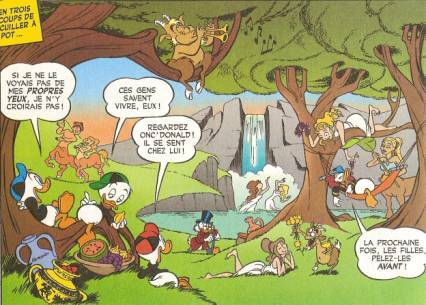 Once again, we witness exactly the same paradox: the Ducks meet mythological creatures, without being really shocked, even though they themselves are Christians! Again the same thing: polytheist and monotheist religions apparently coexist?!? Or (which I do not think) maybe the Ducks are both polytheists and monotheists? Finally, Mayas of the Duck world, just like in our, used to make offerings for their Gods to calm the elements. 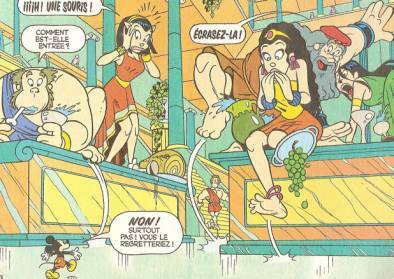 We can see that the ancient religions of the Duck world look like the ancient religions of our world. However, there is one important difference: some of them, like the Greek religion, still seem to exist! The Ducks’ universe reflect our world, so the religions which exist there are identical to our. It is correct for almost all beliefs, everywhere in the world. So, we can conclude that Ducks (and Mice) are Christian, and, like some of us, they are superstitious. The thesis by stud.don.theol. 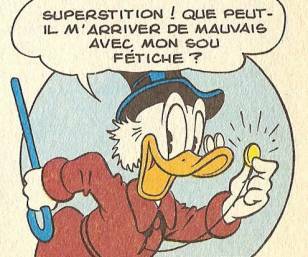 Adrien C. Miqueu on “Religions, beliefs and superstitions in Duckburg” handed in to the Academic Council of the Southnordic Academy of Donaldism a few months ago is certainly taking up a most exciting and relevant topic. It is, however, also a quite difficult as well as touchy study area, not least within Donaldism, where one has to look rather careful for any actual evidence in the sources, and where it is very easy to stir up unscientific emotions among one’s audience. In short, religion is a matter most obvious to take up in Academic Donaldism, but at the same time also a dangerous territory to tread for a young student in his first major academic work. Even more impressive is it that Monsieur Miqueu has come up with such a fine result! 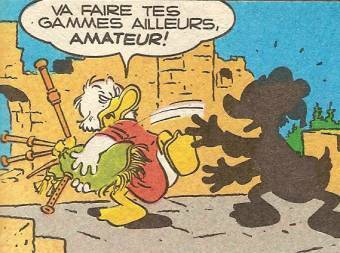 The Ducks are Christian, Miqueu concludes, or at least, their ancestors were Christian, a conclusion based on the identification of various physical and behavioural evidence in Duckburg (e.g. churches, cemeteries, Friday 13th, biblical references, Christmas). 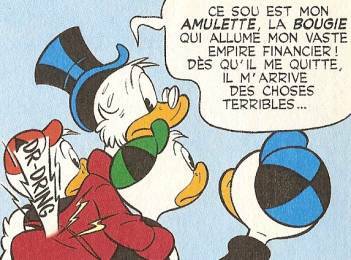 Particularly interesting is perhaps the acknowledgement of Scrooge McDuck’s words (in the French version?) that he repeatedly has gone to the cathedral of Notre Duck - a sign of an active religious life with the old bazillionaire? 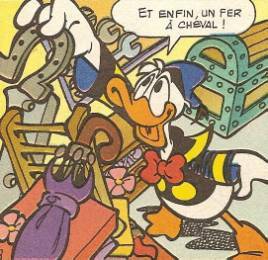 In fact, Miqueu goes far beyond the studying borders set in the thesis title, as he does not only identify religion, beliefs and superstitions in Duckburg, but all over the Duck world - or Stella anatium, as we like to call it in Academic Donaldism. 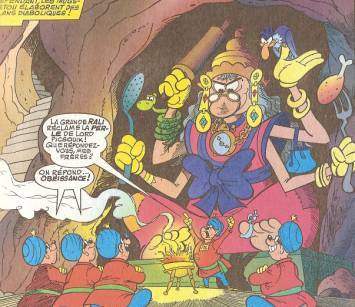 Among the major religions found in Stella anatium outside Duckburg are Buddhism, Hinduism, Confucianism and Shamanism. I am surprised not to see Islam on the list? If Miqueu has not found any evidence of Muhammadanism in the Donaldistic sources, this itself would be worth a mentioning too, I should think? Personally, I cannot recollect seeing any Islamic evidence in the sources myself, with the closest thing being the small Greyducks of the Kasbah Crater in northern Africa, but their popular call-out »Allah Salimak!« (“God bless you!”) really only refers to (a) God and does not state the kind of religion used to worship Him. My esteemed colleague Professor Jacobini (2006) does, however, believe to see strong indications of Islamic culture and religion in his Donaldistic crusade studies. 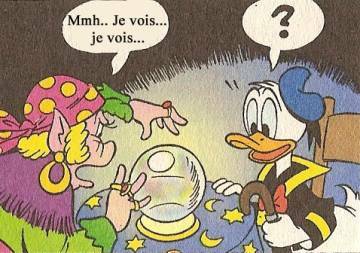 This leads me to some comments on Monsieur Miqueu’s use of sources, which especially for his studies of Stella anatium outside Duckburg appears breathtakingly broad and thorough. Truly commendable and exemplary! A sour old Classic-Donaldist like myself would, of course, have liked to see a bit more examples from the old great masters of Donaldism, such as Barks and Taliaferro. Where is, for instance, Barks’ praying Donald and nephews on the way to Volcano Valley or the Nordic and Greek “gods” of the planet Valhal? 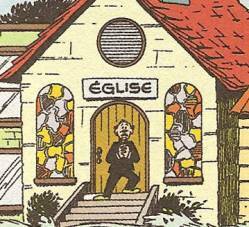 Or the numerous duckumentaries by Taliaferro of an active Christian church life in Duckburg? Whereas our candidate may ignore these claimed lacks as an old “know-all” Ducktor’s attempt to show off, I really would like him to have included the religious sphere of the Junior Woodchucks’ Guidebook, as suggested long ago by Jon Gisle (1973, pp. 79-87) and lately hinted by Professor Airhead (2009). For the evaluation of stud.don.theol. Miqueu’s work in regard of earning him the Academic-Donaldistic master’s degree, it is in fact this absence of historiography within the field of Donaldistic religion that appears as the major scholarly problem. Monsieur Miqueu is, of course, in no way entering a hitherto unchallenged territory, as several established scholars have stepped around on these very fields earlier, and therefore could have deserved a reference or two in this newest contribution to the list. In Miqueu’s defence, however, all major works in Donaldistic religion - until know – have mainly been published in the Westnordic (e.g. Gisle 1973 and Svendsen 2006) or Southnordic (e.g. GrandjeAnd 2003 and Rothstein 2005) languages only, which does, admittedly, narrow down their potential audience significantly. And although the esteemed Dr.don.ext.hon. Hans von Storch once recommended his fellow German colleagues to learn themselves Norwegian in order to be able to benefit from the magnificent Donaldistic work of Jon Gisle, it would probably exceed even my harsh reputation among students to demand something similar of our young French friend on top of all his theological accomplishments. In stead, I will rejoice in the fact that we now have a fine extra-Nordic work on the matter as well. I must admit that I was slightly worried about the opening lines of Miqueu’s thesis, in which he seems to express an expectation that the Ducks should be Christian because the Donaldistic sources mainly have been printed in Christian countries! 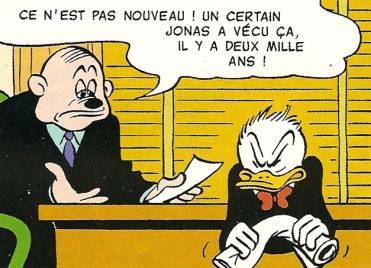 This kind of argumentation tends Donaldistic Socio-Constructivism (“it’s all just a comic book”), a disturbed way of thinking, which is of course considered heresy here at the Academy, but this is surely unintentional with Monsieur Miqueu. In the following, he treats his sources and observations as a true Academic Donaldist, and I therefore have no problem in writing off his initial wording as a youthful mistake. My final comments are related to A.C. Miqueu’s conclusion: »The Ducks’ universe reflects our world, so their religions, which exist there, are identical to our.« This is, I think, very dangerous assumptions to make. 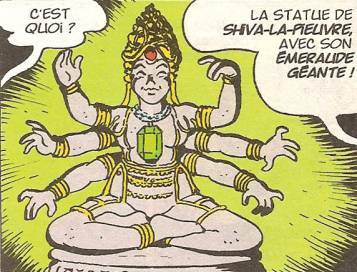 First of all, we should not take similarities between our to worlds for granted, as there certainly ARE important differences to be found - just as Miqueu himself has done, for instance by noting that the Ducks on several occasions have actually met ancient gods, rightfully leading Miqueu to point out the potential paradox of monotheistic Christians meeting non-Christian gods! Secondly, in regard of the Ducks’ world reflecting our, I personally wonder Which world is in fact reflecting which? The Ducks are for real - are we? In conclusion, I want to congratulate the candidate with a commendable scholarly thesis, which I have enjoyed reading very much, and I am looking forward to any future works from this young scholar, be it on Donaldistic religion or other interesting topics. Based upon the abovementioned evaluation, I strongly recommend the Academy’s Academic Council to award Adrien C. Miqueu with the master degree of Academic Donaldism with specialty in Donaldistic religion (cAnd.don.theol.). 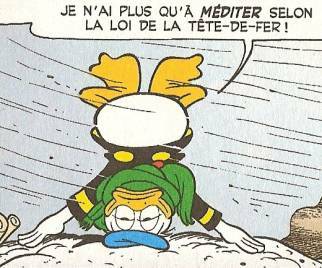 Airhead, John T. (2009): Climate changes in Duckburg - A comparative study of Duckburg weather conditions in 1950, 1972 and 2005, Southnordic Academy of Donaldism & University of Calisota. GrandjeAnd, Jacobinus (2003): Hvorfor være Verdens rigeste and? - et religions-psykologisk kig ind i Joakim von Ands selvopfattelse, Center for Klassisk Donaldisme. Jacobini, Giovanni (2006): Ducks of the Cross - Crusade in medieval Stella anatium, Southnordic Academy of Donaldism. 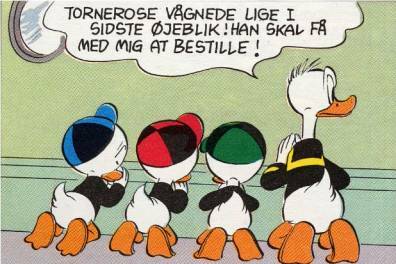 Rothstein, Mikael (2005): "Oh, skænk mig en grav..." - Populærreligion og sekularisme i Carl Barks' Andeby, Københavns Universitet. Originally published in DIN - tidsskrift for religion og kultur no. 3-4/2005, pp. 17-37. 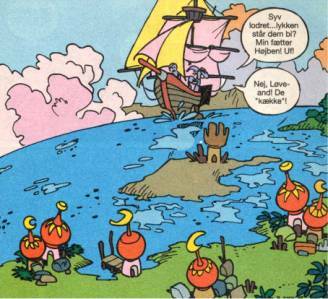 Dr. GrandjeAnd has brought it to the attention of the Academic Council that a highly recognized work on Duckburg Religion written in English does exist on the Internet, namely an English translation of Vidar Svendsen's originally Norwegian work Religion i Andeby (see the bibliography above). Furthermore, as noted by Dr. GrandjeAnd, the chapter titles and the division of subtopics used by Mr. Miqueu have an astonishing resemblance to the ones found in Mr. Svendsen's work. However, a close comparative examination of the actual content and duckumented examples of the two works does, fortunately, completely clear both of the two authors from any suspicions of plagiarism. 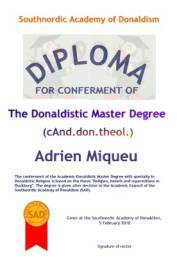 The Academy's Academic Council has after recommendation from the assigned examiner decided to award Adrien Miqueu with the Academic-Donaldistic master degree with specialty in Donaldistic religion (cAnd.don.theol. ), which he is expected to use and show off zealously for the deserved admiration and envy of his surroundings.